HIGH The final leg of the climb is pretty great, and the ending satisfies. LOW Overthinking solutions and working harder than necessary. WTF You said the strawberries had no purpose! Liars!! 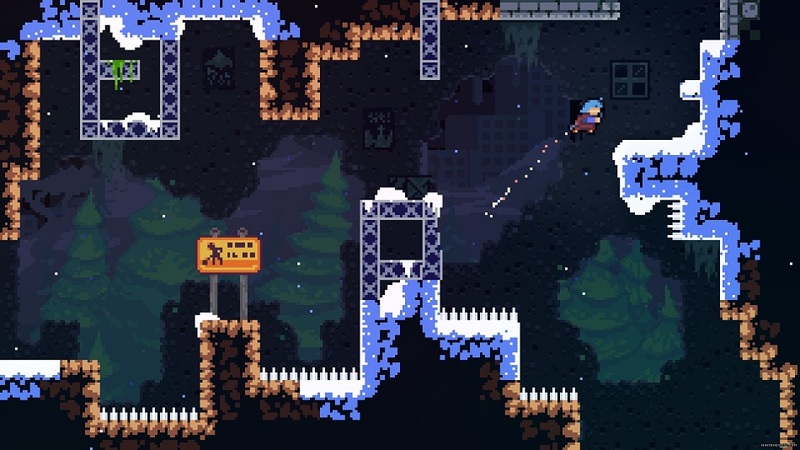 Celeste is a 2D platformer that tells the story of Madeline – she’s a girl who’s working through some issues, and she thinks she can find her answers at the top of a magical mountain. Mechanically, Celeste is incredibly tight and smartly designed, although that’s not to say it’s easy – playing with standard settings, Madeline has quite a task ahead of her. Despite the fact that she sports superhuman jumping, an air-dash, and a knack for clinging to walls like a ninja, it’s barely enough to get through the obstacles the mountain throws at her, and those obstacles are legion. Quite frankly, I found Celeste to be taxing. Each section of the mountain is broken up into bite-sized rooms, and nearly every one required multiple attempts, some more than others. Like, lots more. The content here is on par with something that requires timing and technical mastery, like Super Meat Boy. Success came with repetition, but little of it came without effort, and each new section was more difficult than the last. If Celeste game wasn’t as honed as it is, I likely would’ve quit in short order. However, there’s no question that not only are the controls and mechanics totally dialed in, each level is also designed to exacting specifications. With some finesse and a little creative thinking (along with quick reflexes and sharp eyes) any obstacle can be bested, and the quick-restart function is a blessing — having zero downtime between attempts makes repeatedly falling down the same nearly un-jumpable chasm slightly less painful. 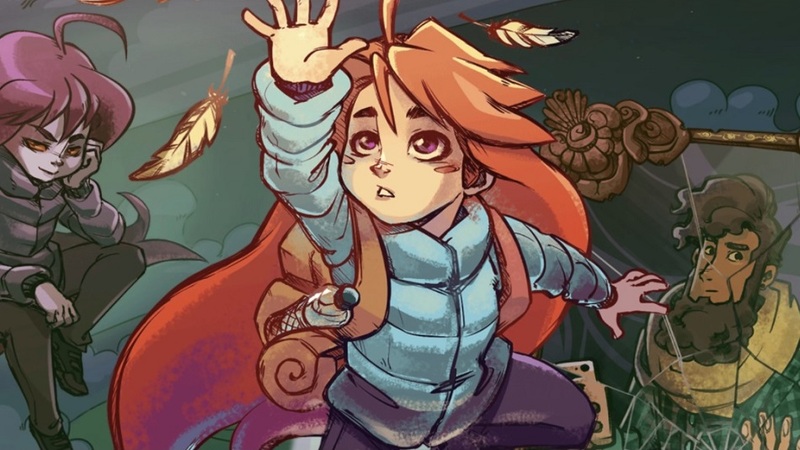 While the gameplay is sure to satisfy the sort of player that digs into stiff platforming challenges, it was really the story in Celeste that kept me moving forward. Madeline is a compelling character who’s trying to make peace with herself, and her attempt to find solace in an arduous task is a relatable one. Along the way, she meets a colorful cast of characters and the surprisingly plentiful dialogue is both charming and smartly-written. I felt invested in Madeleine’s climb and her relationships, and this narrative gave me the strength to go on whenever I got frustrated by the difficulty of the platforming. It must also be said that the adventure’s final leg and ultimate conclusion were quite good, and it was a treat to roll credits and walk away feeling satisfied by both gameplay and narrative. While the things I’ve already outlined make Celeste a clear winner, it also deserves praise for its accessibility options. For those who are either unwilling or unable to play on the default settings, it’s possible to turn on a host of amenities – things like making Madeleine invulnerable to spikes, giving her infinite air dashes, infinite stamina for wall-clinging, and more. Players can activate as much or as little as they like in order to customize the experience, and with a little experimentation, I would imagine that just about anyone would be able to see the game through to the end. As someone who strongly believes that accessibility only makes games better, my hat is off to the devs. Disclosures: This game is developed and published by Matt Makes Games. It’s currently available on PS4, XBO, Switch and PC. This copy of the game was obtained via publisher and reviewed on the Switch. Approximately 8.5 hours of play were devoted to the single-player mode, and the game was completed on the standard settings. There are no multiplayer modes. Deaf & Hard of Hearing Gamers: No audio is necessary for play, all dialogue comes via text, and the entire game was completed with the sound muted. It’s fully accessible. Ok, it specifically says, “The strawberries will impress you’re friends, but that’s about it.” And then, when it comes time, the purpose of the strawberries is LITERALLY to impress your friends. It’s clever writing but it doesn’t lie . . .